China and Egypt are two of the world’s oldest and greatest civilizations. So which is the better growth story? This chart from visualising Economics shows that Egypt gradually lost its advantage by 1100. Egypt surged ahead in the 1850s at the heights of the Muhammed Ali dynasty, when cotton production was booming and construction started on the Suez Canal. In 1994, China’s huge boom took the lead again. 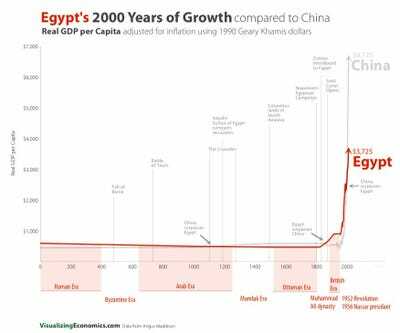 But Egyptian growth has actually continued to be strong.